Complete the registration form below (one per person please) to register for the March 29-April 1 LOTW weekend. Please read the terms and conditions below the form and click on the "I agree" button before clicking on the "Submit" button below to submit your registration. Your registration will be acknowledged within a day by E-mail. Questions? Contact Deacon Tim Weinmann ( tweinmann@cdlex.org or 859-266-9314). If nothing indicated here, assuming no restrictions on diet. By submitting this registration, I am committing to attend the LOTW retreat scheduled for November 16-19, 2018 at the Cathedral of Christ the King. I am a baptized Catholic, a spouse of a baptized Catholic, or engaged in the RCIA process at the Cathedral parish. Contact Deacon Tim Weinmann ( tweinmann@cdlex.org or 859-266-9314) if you don&apos;t fit into any of these categories and you wish to make this retreat. I understand there is no advance fee to make the weekend. I further understand there is a cost to the parish in order to put on the weekend and that there will be a love offering requested at the end of the weekend. I will prayerfully consider responding to the love offering based on blessings received from the weekend and as I am financially able to do so. ( tweinmann@cdlex.org or 859-266-9314). Should something come up that prevents me from attending, I will contact Deacon Tim as soon as possible so that those who may be on the waiting list will have a timely opportunity to participate. The World Needs the Light Christ Placed in You! 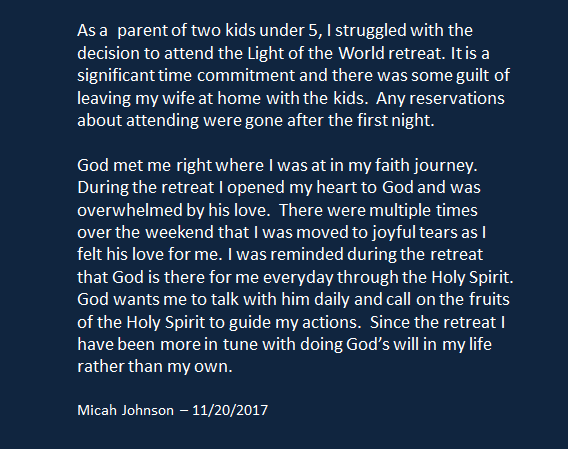 The next Light of the World Retreat is scheduled for March 29-April 1, 2019. Check out this introduction to LOTW from those who have experienced it. What is the Light of the World Retreat? A parish-based weekend retreat intended to provide a personal encounter with Jesus Christ through the power and inspiration of the Holy Spirit. The weekend invites participants to discover or deepen their personal relationship with Jesus and his Church. The retreat is open to both men and women parishioners (18 or older). Free childcare (ages 0-8) offered on the first (Friday) and last (Monday) evenings of the retreat. Through the power of the Holy Spirit, we are invited to accept God’s free gift of salvation in Jesus and then commit to maintaining and building that relationship for a lifetime. The goal of LOTW is to invite (or renew) each retreatant into a personal, intimate relationship with Jesus Christ and then provide them the tools to maintain and build on that relationship as a life-long disciple. During the retreat, the Good News of Jesus Christ and His personal love for us is connected to the sacramental life of the Church. The Light of the World Retreat seeks to help retreatants access that storehouse of grace that too many have taken for granted. This is accomplished on the weekend through powerful renewals of the Sacraments of Reconciliation, Baptism, Confirmation, and Eucharist. Participants are invited and encouraged to join or start a small group to keep the flame of the weekend alive for the long-haul. Participants provide love, care and support for one another as disciples on the journey - seeking always to enter ever more deeply into relationship with Jesus and to serve Him and His Church. Small group participants meet regularly to connect, ask questions, get answers, build trust, share their faith together, and enhance their lives and the lives of others by deepening their faith in Jesus Christ. This helps the parish build a community of communities – so parishioners come to share life with one another and enhance the idea of the parish being a large family and complimenting our weekend/Sunday communal worship experience at Mass. The retreat is open to all parishioners (both men and women) 18 or older: from the new faith seeker to the most faith-filled disciple and helps them to become (or renew) their role as a follower of Jesus who seeks to find their place in God&apos;s plan for their lives, their parish and their community. The weekend is led by a team of four evangelists and a member of the clergy from the parish. The weekend is held at the parish – but everyone goes home at night and sleeps in their own bed. * - Free childcare (ages 0-8) offered on the first (Friday) and last (Monday) evenings of the retreat. The weekend consists of a series of talks, activities, small group discussions, along with periods of individual adoration which provide time during the weekend to process what is being experienced. The environment is focused but at the same time relaxed. Mass is built into the weekend on Sunday so no worries about your Sunday mass obligation. The Monday evening session is an essential part of the weekend so plan on being at that closing session. Lite breakfast is provided on Saturday and Sunday. Lunch and supper are provided on Saturday and Sunday. Lite snacks/drinks provided during the weekend. Is there a cost to attend the weekend? There is no fee due in advance to make the weekend. There is a cost to put on the weekend and a love offering is requested at the end of the weekend. Participants are simply asked to give in response to the blessings they receive during the weekend and as they are financially able to do so. There is the notion of paying it forward so future parishioners can make the weekend (especially those who can’t afford it). But the cost of the weekend should never be a reason not to make the retreat! How does one sign up for the weekend? If you have questions, contact Deacon Tim (tweinmann@cdlex.org or 859-266-9314). Capacity for the weekend is 60. A waiting list will be maintained if/when needed. 31 people participated in the first Light of the World Evangelization Retreat in the entire state of Kentucky and took place November 3-6,2017. The Holy Spirit was most definitely acting in amazing ways throughout the retreat.